Hi everybody! Today’s guest teacher is my old friend and he is now my Angel buddy, Max. He used to live in Prague, but he is now lives in Doggie Heaven with me. We’ve made a couple of lessons together in the past. Hello, long time no see! I’m Max. Maggie and I made this lesson together for Facebook before we became angels. I will add more information this time and would like to dedicate this lesson to my beautiful mom, Nina. must, need to do something, ought to do something, have to do something. 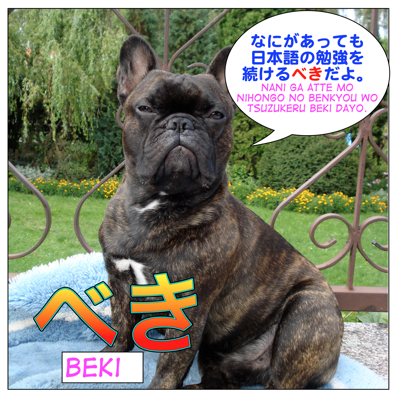 So べき ( = beki) is used to show when you think someone must do something or something should be done. It sounds much stronger than した方がいい ( = shitahou ga ii ) should. = Kanojo ni ayamaru beki desu. = You ought to apologize to her. = Sonna koto wo iu beki de wa airmasen. = You must not say things like that. = Ima shika dekinai koto wo yaru beki desu. = You should do the things that you can only do now. = Anna hito to wa wakareru beki da. = You should break up with someone like that. = Maggie Sensei Motto yaseru beki dayo. = You should lose more weight, Maggie Sensei. ＝ Kono eiga wa zettai ni miru bekida. ＝ You really should see this movie. ＝Nina mo Nihon ni iku beki desu. = Nina should also go to Japan. = Kanojo ni shiraseru bekida. = You should tell her. = Ima watashitachi wa motto setsuden wo subekida. = We should save electricity more now. = Maihoumu wo kaubeki ka mayou. = I don’t know whether I should buy my own house or not. You can ask someone for their opinion on whether or not you should do something. = Nee, kare ni denwa wo surubeki dato omou? = Hey, do you think I should call him? = Un, yuuki wo dashite kare ni denwa wo kakeru beki dayo. = You should be brave and call him! You also say すべき ( = subeki) in more formal Japanese. = Motto benkyou subeki desu. = You should study more. = Korekara no nihon wa dou subekika. = What Japan should do now? = Sonna koto wo iu beki dewa nai. = You shouldn’t say such a thing. = Sonna koto wo iu beki janai. = Kanji no benkyou wo akirameru beki dewa arimasen. = You shouldn’t give up on studying kanji. = Ketsuron wo isogu beki dewa nai. = We shouldn’t jump the conclusion. = Ima wa, sonna koto wo yaru beki janai yo. = Kare to wakareru beki janakatta. = I shouldn’t have broken up with him. = Kare to wakarenakereba yokatta. = Watashi mo onaji mono wo tanomu beki datta. = I should have ordered the same thing. = Kanojo no denwa bangou wo kiku beki datta. = I should have asked her phone number. = Motto isshoukenmei benkyou wo suru beki datta. = I should have studied harder. = Anna hade na kekkonshiki wo surubeki de wa arimasen deshita. = We shouldn’t have had that luxurious wedding party. = Kimini uso wo tsuku beki dewa nakatta. = I shouldn’t have lied to you. = Ikiru beki ka shinu beki ka. =To be or not to be. = Nihongo no benkyou wo tsuzukeru beki ka douka wakaranai. = I don’t know whether I should keep studying Japanese or not. = iPhone 6 wo kaubeki ka douka mayotte iru. = I am wondering whether or not I should buy an iPhone 5. = Yarubeki kotoga ippai aru. = There are many things that I should do. = Kono sakubun niwa naosubeki machigai ga ikutsu mo aru. = There are several mistakes in this composition. = Kare wa, benkgoshi ni narubeku hougakubu ni haitta. = He entered the law faculty in order to be a lawyer. = Minasama no gokitai ni sou beku doryoku shite mairimasu. = I will do my best to meet your expectation. = Minna no chikara ni naru beku ganbatte nihongo wo oshiemasu. = I will do my best to be helpful in teaching everyone Japanese. This expression is only used in written form when you warn, prohibit people not to do something. It’s quite common in old expressions/sayings. So don’t use it in conversation unless you are quoting an old expression/sayings. = He who does not work, neither shall he eat. = Freshly painted. Do not touch! = Thank you, Max Sensei! = Watashi mo Max Sensei nimattakku doukan! = I totally agree with you. = Donnani taihen demo, nihongo no benkyou tsuzukete ne. = No matter how hard it is, please keep studying Japanese. That makes a question floating in my head. Is べきだった only used for the first person (I) since it has some reflection meaning. Is べきだった used for the other person also? You can use べきだった for someone else, too. You should have been nicer to her. He should have tried harder. Sensei,How different between べき and なきゃ, なくちゃ? べき is more literal and stronger. なきゃ／なくちゃ is much more casual. Also unless you express your own regret, 〜べきだった, you don’t usually use べき for yourself. I read over and over your lesson then 1 more question comes out. (2) As the company rule, people should were uniform. Thanks Maggie sensei as always. I have a question about べき。 Could you help me as you always do ! If べき is more about obligation, then I don’t know what the obligation in this sentence. Since breaking up with him is the choice of the one person, not an obligation, isn’t it? Right. You can decide whether you break up with someone or not. If your friend is going out with a bad person. How would you feel? You think your friend should break up with that person, right? When you strongly think that someone should do something if possible, you can use べき. This lesson has been very useful, thank you. I have a question. There are several mistakes in this composition. There are several mistakes that I should fix in that composition. There are several mistakes that should be fixed in that composition. (person) は Verbべきです pattern is when you give someone an advice so 私はVべきです is unnatural. I understood your explanation. I should use the form てはいけない in te first person instead beki, but i wish to know if its ok use the form ばいい with first person. Yes, you can use ばいい with the first person. All your sentences are very natural. It depends on your level. But if you are just making simple sentences, stick to を. Eventually you will learn this form. この映画を観たい = I want to see this movie. この映画は観たい (stronger feeling/emphasizing this movie) = I’d love to see this movie. 人参（にんじん）を食べない= I don’t eat carrots. 食べすぎる ( = tabesugiru) means “to eat too much” and you say that when you can’t control your appetite. With regards to べき, would like to know if the following sentence is correct? A little unsure on how to write a sentence with べき when speaking/referring to more than 1 person..
べき(=beki) is for more obligation. Thank you very much for this lesson, Maggie! Also we can sometimes see べし which is the 終止形 of べき used in Classical Japanese (in fact the verb べし has 6 different meanings in Classical Japanese, in Modern Japanese there’s only one meaning). The negative form of classical べし in 未然形 is べからず. In the middle of the sentence べからざる is used as the 連体形 of べし. Thanks for this great lesson! I had some lingering doubts about the use of beki, but now I have learned about it and more. Hi reid! Good to hear you have learned something from this lesson. Sensei, how do I know if the subject “you, I, we, they”? Can you explain? I’m rather perplexed to determine it. Unlike many textbook Japanese, we often skip the subject in natural Japanese so it is hard for you to determine the subject in some short example sentences. Only the speaker/writer can decide. In this lesson it’s me. Yeah, when I was starting I had the same questions. Over time you will learn that in general you just pick up the subject by context.